When this movie hits the big screen next month we are going to hear a lot of talk about Intelligent Design, Creationism and Atheism. It should be interesting. This is the continuing journey of my "Class 100" at Scottsdale Bible Church. In my last post, from this class, we learned about things such as justification, sanctification and glorification. All big "biblical" words but, as we learned, very important for someone desiring to be a disciple of Jesus Christ. In that last post, we learned that as Christians we live in "that thick middle stage of a believer's second life (on becoming a Christian) sandwiched between two thin slices of grace and glory". Sanctification sandwiched between justification and glorification. We further learned that sanctification is a process. In Christ we are set apart and we are to move forward on the journey towards holiness. Today is Good Friday. As I pause to consider the events of that day, two thousand years ago, I scarce can take it in. As God, you became man. I scarce can take it in. You were born of a virgin, walked this earth and forever changed the history of the world. I scarce can take it in. We gave you a crown of thorns and beat you with all of hell's fury. I scarce can take it in. We made you, beaten and bloody, suffer the humiliation of dragging your cross to the hill. I scarce can take it in. We hung you on a cross! We mocked you and gambled over your clothing. I scarce can take it in. You died. With your death you gave me entrance to the holy of holies. You gave me eternal life. You replaced the law with a new and wondrous covenant. I scarce can take it in. You chose me, me of all people, to spend eternity with you because of my simple child-like faith in you. I scarce can take it in father. My tears father, how do I comprehend all of this. How does my finite mind begin to comprehend such love. Father, I scarce can take it in! I call you Abba, Father. Thank you Abba. Thank you for this day, two thousand years ago, for dying for me and allowing me to spend eternity with you, and my family and friends, and all the saints in eternity. I scarce can take it in Father! 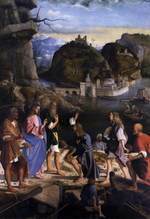 The painting to the left is,Call of the Sons of Zebedee,by Marco Basaiti (1510). Our second class in the "Class 200" series continued with the discussion of discipleship. This is an important question as many unknowingly fall into the camp of working on their salvation. Many, myself included, had no idea what an important distinction this is. As a disciple of Jesus Christ, it is important that we know and understand where we stand. What is our current position, if you will, in the Kingdom of God? In the Christian liturgical calendar, Maundy Thursday (Holy Thursday) is the day before Good Friday. This day is set aside to reflect on the washing of the disciples feet by Jesus, Communion and the Last Supper, the agony of Christ in the Garden of Gethsemane and finally the betrayal of Judas Iscariot. I didn't grow up in a "liturgical" setting and therefore we didn't observe many of these "feasts". In some ways I think I missed out, in my youth, by not having many of these important facets of Christ's life stamped into my consciousness. On the other hand, I have also observed that many of my friends, in more liturgical churches, seemed to participate in these observances out of tradition rather than a heart felt recognition of Christ's life. Jesus Christ, fully God and Creator of the universe, humbled himself and washed the disciples feet as a demonstration of His love and then instructed them to do likewise (love one another). He told us this over and over and over. Love God and love one another. How are you going to love someone today? This guy looks like I feel today. In April of 2006, my wife and I sold our mortgage company and I left an industry that provided very nicely for us for over 20 years. About 7 years ago I started noticing some clear insanity coming into our industry. Our industry was going to lend people money and let them lie about their income. This incredulous product came to be known as the "no doc" mortgage loan. I told my employees that this was a bad idea, for our clients and our industry, and that I did not want to participate in this fragment of our industry. Fast forward to 2007. The mortgage industry has taken a severe hit and the real estate industry is about to go up in flames. Individual real estate "investors", who through their own greed, were dropping like flies and personal bankruptcies and foreclosures jumped to all time highs. 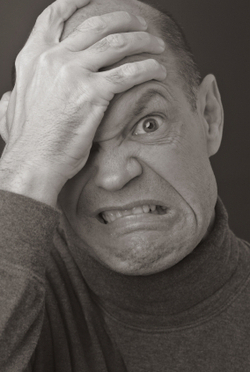 The mortgage lender "implode-o-meter" tells us that 241 mortgage lenders have imploded! Just yesterday, we see that Bear Stearns has imploded leaving investors with perhaps $2 for $170 stocks (last years high). Why did all this happen? Greed! Plain and simple greed! The mortgage industry allowed greedy people to buy properties they couldn't afford and then turned around and sold those loans, with the promise of ridiculous returns, to greedy investors. The whole mess blew up! Trillions of dollars will be lost! I am deeply ashamed of my (past tense) industry for allowing this to happen. When I started crying foul years ago, no one listened. Every slime ball in the country crawled out from under a rock and became a "mortgage consultant"! I am certainly nowheres near comparing myself to Jesus Christ. I have my faults just like everyone else. But, through this mortgage fiasco, I certainly have an understanding how Jesus felt when he busted the chops of the money changers in the temple one day 2,000 years ago. I must confess, I am truly dealing with some anger issues on this one! Scottsdale, Arizona - today is St. Patrick's Day. You know... green beer, shamrocks, goofy green hats and a day for all of us to have a "touch of the Irish". But just who is St. Patrick and what is this day all about....really? 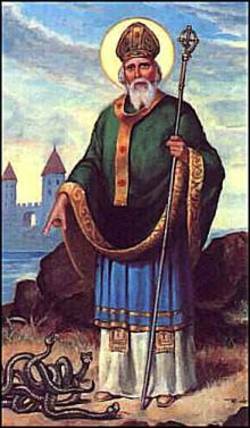 "Patrick is remembered today as the saint who drove the snakes out of Ireland (not true), the teacher who used the shamrock to explain the Trinity (doubted), and the namesake of annual parades in New York and Boston. What is less well-known is that Patrick was a humble missionary (this saint regularly referred to himself as "a sinner") of enormous courage. When he evangelized Ireland, he set in motion a series of events that impacted all of Europe. It all started when he was carried off into slavery by Irish raiders." The above quote was taken from Christianity Today's "Christian History and Biography" page entitled, "131 Christians Everyone Should Know". Click the link above and go read about the real St. Patrick of St. Patrick's Day. 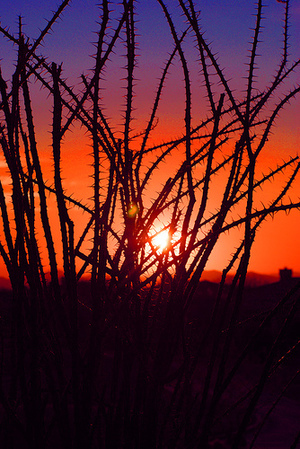 Scottsdale, Arizona - Palm Sunday is coming tomorrow and as I began to think about it, I realized that I really didn't understand what all the fuss was about. I knew that there were palm branches, hosannas, and Jesus riding on a donkey. 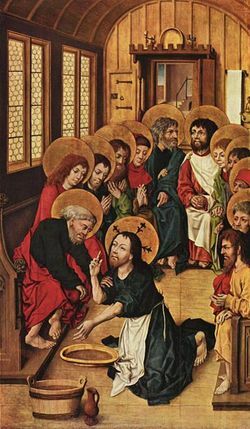 Jesus had recently raised Lazarus from the dead and there were HUGE crowds following him around and to greet him in Jerusalem. It was Passover and Jerusalem was full of perhaps a million people for this sacred day. Jesus created a lot of "buzz" in this crowd. So much that the religious leaders were very worried about his influence on the large crowd. The large crowd heard that Jesus was coming and greeted him with palm branches saying, "Hosanna, blessed is he that comes in the name of the Lord." The Jews were tired of being subjects of the Roman Empire and thought that Jesus was finally going to pronounce himself as king and crush their adversaries. Instead of riding in on a large white horse, or a donkey, Jesus rides into town on the colt of a donkey! His feet were probably dragging on the ground! Their expectations were not met and many of these same people, in five short days, would be crying, "crucify Him!" The photograph above shows palm branches, but there is also a cross laying in them. On Friday, Jesus will be crucified fulfilling His purpose on the cross. So...on Palm Sunday I will be remembering the fact that Jesus did not come to meet my human expectations. I will also be remembering that I just don't understand all that goes on around me. Now two thousand years later, I understand that Friday is coming. I also understand that Easter is coming as well. Therefore, I will come to Palm Sunday with a contrite heart, seeking forgiveness for my nagging bouts of behavior that border on distrust, acknowledging that He, the Creator of the universe, is indeed my God and thanking Him for what He is about to do on Friday. Here is an inspired recording of Darryl DelHousaye, Pastor Emeritus of Scottsdale Bible Church, where I learned these things. This painting is, "The Triumph of Mordechai", by Jacob Willemsz. de, the Elder. These are my notes and thoughts from Jamie Rasmussen's 8th installment on the book of Esther at Scottsdale Bible Church. There has now been a significant transfer of power in our story. 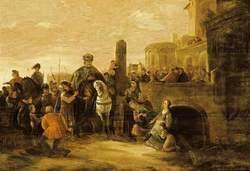 Through Esther's faithfulness to God, Mordecai has gone from someone who sits at the king's gate everyday to being pranced around town on the king's horse by Haman, to seeing Haman hung on the same gallows that were built for his destruction to finally becoming second in command in the Persian nation. An incredible series of events! We pick up our story in chapter 9 with the edict still in place for the annihilation of the Jews. Evidently, in that culture, once the king made an edict even the king did not have the power to undue his own command. Therefore, the day for the annihilation of the Jews, as proclaimed by the now dead Haman, was still at hand. The book of Esther tells us that Haman wasn't the only man in the land that was looking for the destruction of the Jews. Evidently, in this vast kingdom, there were many people who, for one reason or another, were looking forward to this day. There were other enemies of the Jews in the nation of Persia. With the power given to him by King Ahasuerus, Mordecai set out to defend the Jewish nation. Under Mordecai's power was the full strength of the king's army and the whole government. With this power Mordecai killed those who were set on his (the Jews) destruction. That day Haman's 10 sons and 75,000 others were put to death. It is interesting to note that in this bloody scene, Mordecai only killed those who intended to kill the Jews, he only killed men and he didn't take any plunder. He could have taken the lands and wealth of those who opposed him but he didn't! As Jamie Rasmussen commented from the pulpit, how on earth do we draw lessons from this bloody scene? Jamie's answer was power. How do we understand power and how do we handle it when we have it?